When I recently read about Cardinal Sarah’s expressed hope that the Traditional Offertory Prayers would be included in the next edition of the Roman Missal, I was very happy, because this is exactly what is needed, if what Pope Benedict XVI asked for with respect to the two Forms of the Roman rite, namely that there would be a mutual enrichment of each Form, becomes something real. Because of the prejudicial opposition of the current liturgical establishment, this has not happened. They would argue that it is forbidden to mix rites. One cannot use prayers from the Melkite rite in the Roman rite. And they are correct. But there is nothing that says that one cannot use prayers from the Extraordinary Form in the Ordinary Form. There is no such prohibition to be found anywhere, because our situation is sui generis. In this light, I am proposing a list of ways that the Ordinary Form of the Mass can be enriched by elements of the Extraordinary Form. While this is addressed mainly to the many young priests who are open to importance of the Extraordinary Form and want to learn it, these suggestions pertain to all priests who love the Mass and want to celebrate the Novus Ordo in continuity with what has come before. The basic premise underlying these suggestions is that what was sacred then is sacred now. Say the vesting prayers before Mass. 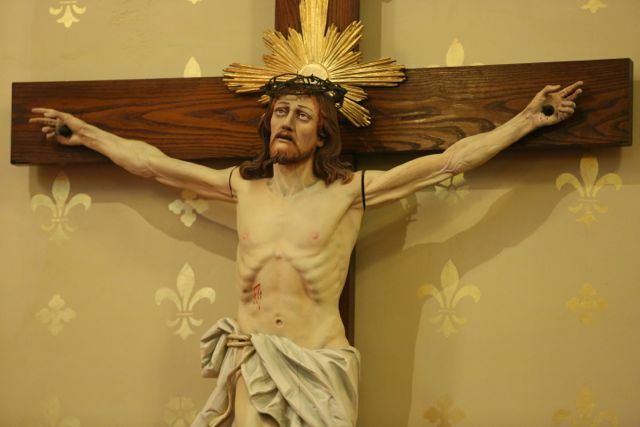 They are a wonderful way to remind the priest what he is about to do: to offer the re-presentation of the Sacrifice of Calvary and his own unworthiness to do so. Always wear the amice. The amice is optional is the Novus Ordo but is required if whatever the priest is wearing at the neck is exposed. Of course, this is not enforced. The amice is the “helmet of salvation” and should always be worn at Mass. Wear the maniple at every Mass. 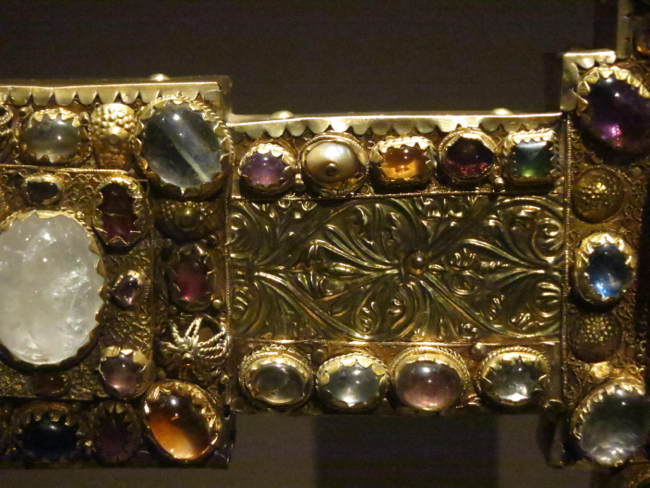 The maniple was never abolished as a vestment. It is just not mentioned. To wear this ancient vestment that is a symbol, among other things, of the servanthood of the priesthood is a wonderful reminder to both priests and laity of what the priesthood is all about. If possible celebrate Mass oriented. This is the Traditional way to celebrate Mass. The people and priest face God TOGETHER in prayer. This is indeed difficult, given the current non-thinking acceptance of Mass celebrated versus populum. Read Father Uwe Lang’s definitive book . There are severe obstacles to celebrating Mass with the traditional orientation, and in most circumstances it will be impossible due to the opposition (grounded in ignorance) of one’s superiors. If you are a pastor, before you make this move, you must educate your people in the historical and doctrinal issues that lie at the heart of celebrating Mass ad orientem. The Ravine – the site of the martyrdoms. 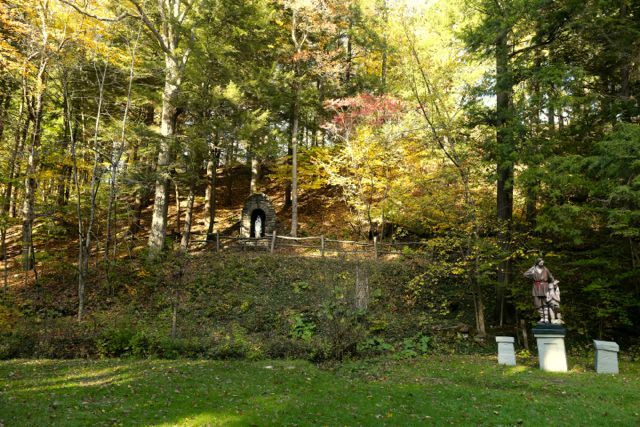 As so often in the past, we came back again this year to the shrine of the North American martyrs in Auriesville, New York (west of Albany) for a personal “pilgrimage.” The time was right – it was the Saturday before the feast of St. Isaac Jogues on October 19. The fall weather and the foliage were magnificent. Only the temperature was distinctly on the chilly side – snow fell the next day. That’s the reason the “Pilgrimage for the Restoration” – which originally took place at this time – was pushed back to September. 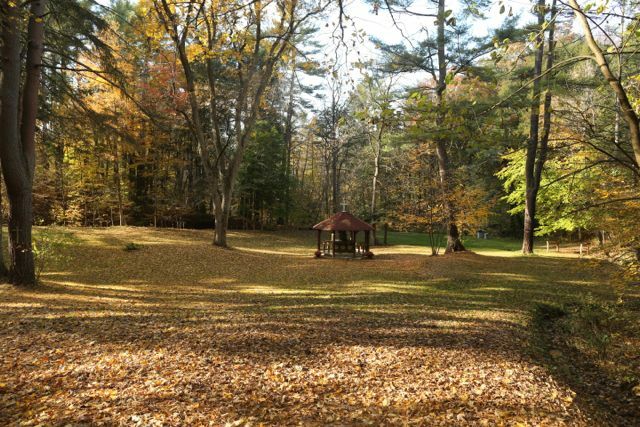 (Above and below) A strange, sacred calm prevails here in the “offseason.” That is particularly so in the Ravine – the holiest part of the shrine – where Rene Goupil was martyred. (above) The deserted second shrine church from the 1890’s. Only a handful of visitors could be found on the grounds of the Auriesville shrine this brilliant Saturday afternoon. 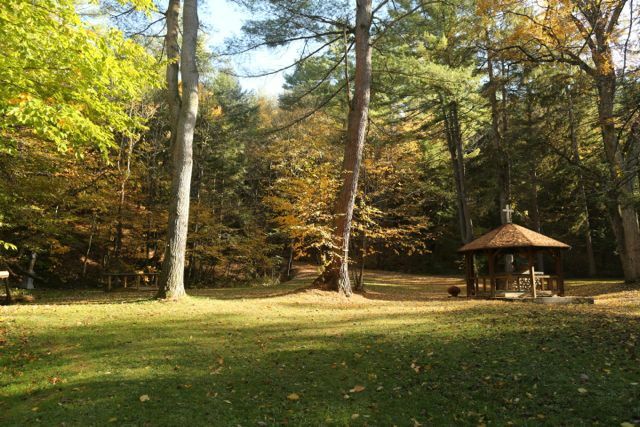 The shrine “welcome center” and bookstore were “closed for the season.” Signs of neglect abound: outdoor stations of the cross have been knocked over here and there; a a large cross formed of pine trees created to advertise the shrine to the nearby thruway is sadly overgrown. Yet the brooding silence is welcome relief from the daily reports of the unfolding chaos of the synod in Rome. (Above and below). 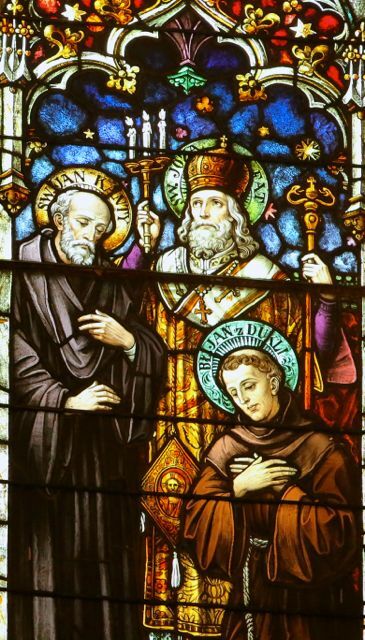 After 120 years the Jesuits are giving up at the end of this year care of the Shrine of the North American Martyrs. “We’re moving on!” one of them proudly told us. Who will take over the spiritual care for the shrine is uncertain at this time. But this year money has become available – from the Knights of Columbus, among others – for some urgently needed repainting in the main church. 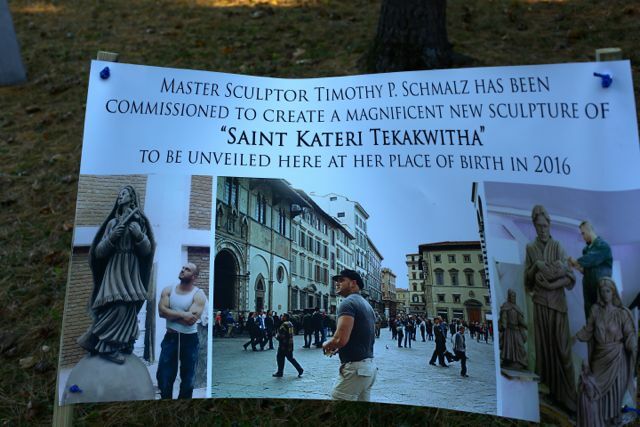 And it seems that “master sculptor” Timothy P. Schmalz has obtained two or three big commissions. (Below) It seems that the modest Victorian statuary of the past no longer suffices. The new funds are a mixed blessing indeed. (Above) As the Catholic Church contracts, the Buddhists expand. 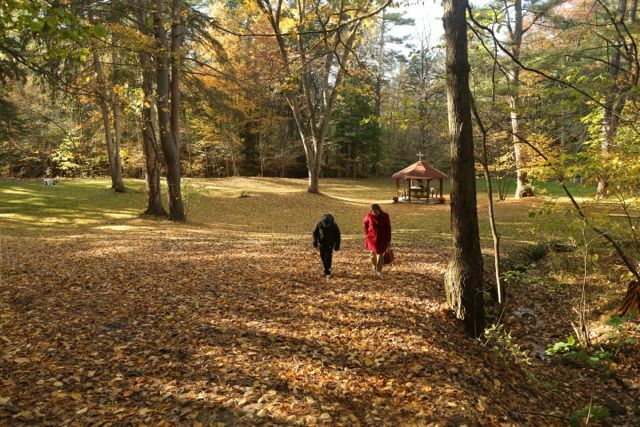 Some years ago the Jesuits sold or leased the former Jesuit retreat house to a Chinese sect. 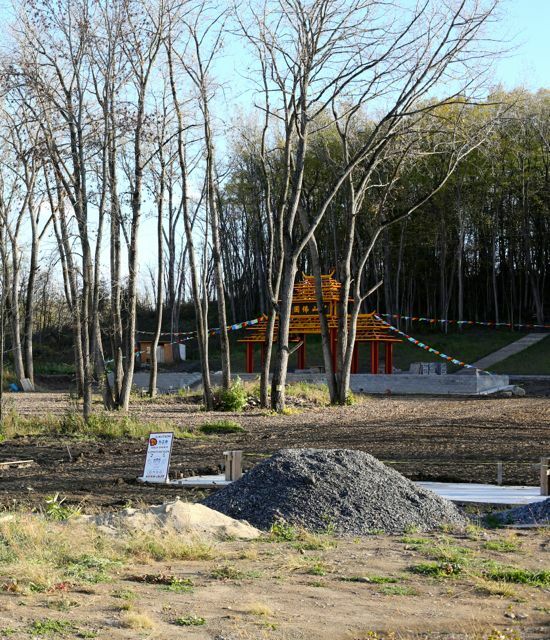 They have expanded, constructing a pagoda-like tower peering over the shrine and a very Chinese-looking gate. The Buddhists have also gotten into disputes with the shrine over non-payment of utilities and the use of an access road (below – the “Father” is the Jesuit head of the shrine). What happens next is anyone’s guess. In the last few years, confronted with decreasing numbers of visitors (and correspondingly diminishing donations), the Jesuits responded by restricting or excluding Traditionalist pilgrimages. We would hope the new management of the Shrine of the North American Martyrs adopts a more Christian approach – and shows more energy in promoting what should be focal point of Catholicism on the East Coast. The “Evangelical Advantage” by Rod Dreher in The American Conservative. In either model, Catholics wind up as one of the biggest losers even though their odds of retaining the children born into their faith are in the middle of the pack. They’re not a strong enough attractor of people leaving other faiths to replenish the people they lose, and so their share (of the US population) diminishes to the single digits. These numbers startled me. I had no idea that the Catholic collapse was so dramatic, probably because the headspace I live in daily, online, is so strongly Catholic. Catholicism is on track to become such a minority religion in America that absent some dramatic shake-up, its numbers will in the future look like those of historically black Protestants today. Now, one in five Americans is Catholic; on current projections, only about one in ten will be in the future. (I can’t tell what the timeline is here; how far into the future does the analysis run?). Of course anything might happen to change this trajectory, which is why Leah says that you should look at the data not as a sign of what’s going to happen, but rather of what’s happening now. And much more. It is an article everyone should read. St. Stanislaus in New Haven – a Photographic Essay. 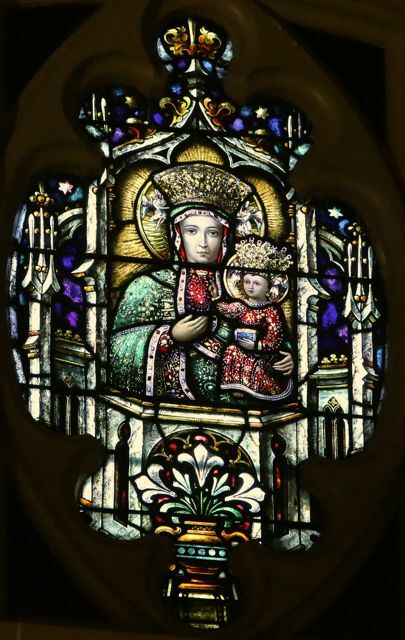 St. Stanislaus in New Haven – a very active Polish ethnic parish with a magnificently preserved church. Since 2009 it has been home to the St. Gregory Society, the pioneers of the regular celebration of the Traditional mass – with complete ceremony and music – in this part of the world. I recently was fortunate to be granted the opportunity of taking pictures of the interior. (Above) St. Stanislaus, founded in 1901, has been a Vincentian parish since 1904. The current church was dedicated in 1913. 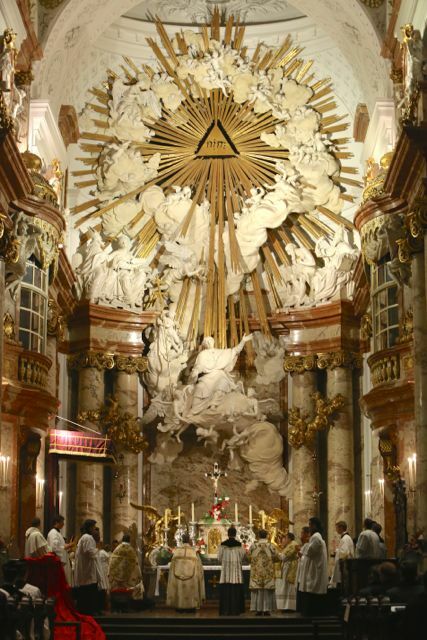 A magnificent high altar – and an abundance of statuary. The old churches of the Germans, Poles and Slovaks so often have particularly rich and colorful appointments. 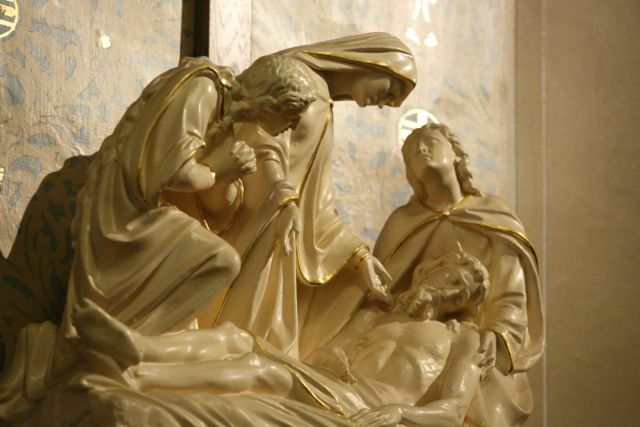 (Above) One of the Stations of the Cross. An elaborate program of paintings covers the entire interior. I am told these works were created over the years by two local artists who filled the church (and the rectory!) with an almost baroque superabundance of art. 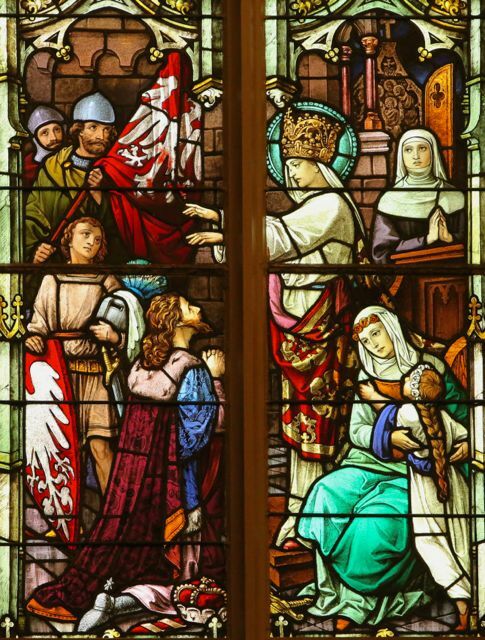 (Above and below) The art of St. Stanislaus church celebrates not only the realm of the sacred but also the secular history of Poland. Here a king and queen of Poland responsible for the first union between Poland and Lithuania at the end of the 14th century. 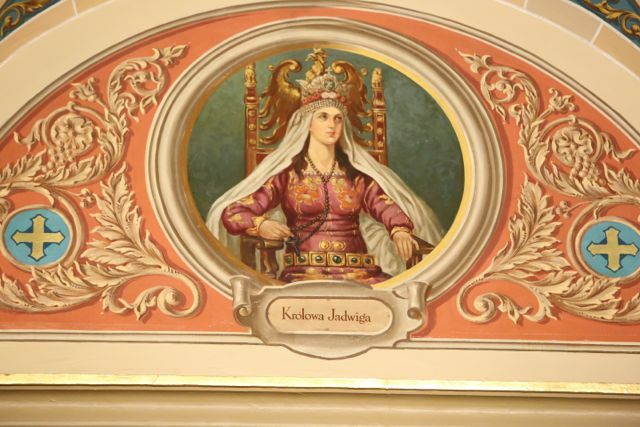 (Queen Jadwiga was canonized in 1997). 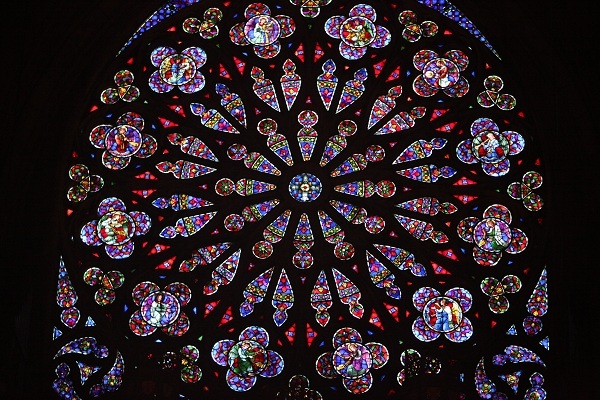 As one might expect,there is also magnificent stained glass. 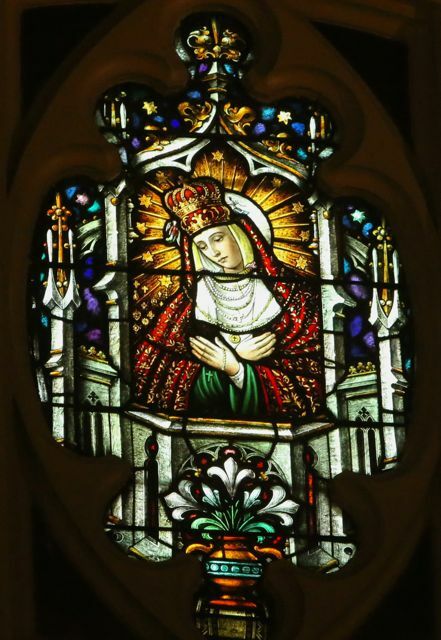 In addition to the “standard” sacred topics so often found in the stained glass imported from Germany and Austria up to the 1930’s, the windows of this church also depict many unusual and specifically Polish subjects, including a number of Polish saints. Not all of these local patrons are ethnic Poles. Below, the martyr St. Josaphat with the vestments and pontifcals of a Greek bishop, including the trikir and crosier with serpents. He was Ukrainian but lived and died in the vast Polish-Lithuanian state of the early 17th century. Beside him stand St. John Cantius (patron of the well-known Traditional parish in Chicago). 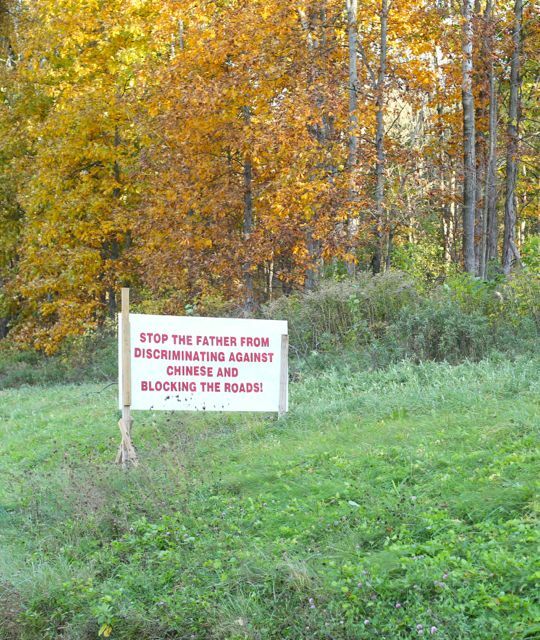 Furthermore, in this same pastoral letter, the Cardinal states that the proceeds from the sales of this “unused” property will serve as the source of funds for the creation of “endowments” to fund everything from “Catholic Schools” and “Religious Education,” to “The Sheen Center,” the “Gianna Center for Women’s Health,” and “FOCUS,” an apostolate aimed at university students. The Cardinal should be reminded that in any situation where parishes are merged, the “goods and obligations,” (i.e. buildings, bank accounts, and debts where they exist,) are to be transferred to the parish into which the former parish is merged. Are the parishes of the archdiocese, either individually or collectively going to take on the management of the projects the Cardinal mentioned? I ask this question, in light of the statement from Cardinal Dolan that funds from the sale of “unused” property will be used for all of the above stated purposes. The Archdiocese of New York should not be receiving any funds in excess of whatever parishes may directly owe the archdiocese at the time of their closure, and even in these cases, such deficits do not constitute legitimate reasons in and of themselves for the sale of a former parish church building itself when a concerted effort to preserve the church as a sacred space for at least occasional use exists. All of the above information can be summarized as follows. Parishes in the New York Archdiocese can be merged to create larger parishes, if that is the course of action the Cardinal wishes to undertake. The church buildings of those former parishes however, some of them being majestic structures of great historic significance, cannot merely be closed and sold at the time the parishes associated with them are extinguished unless a grave reason justifying their permanent closure exists. While there is no guarantee that mass will be regularly celebrated in a church which is no longer the seat of a parish, as long as a church remains “open,” (i.e. no decree has been issued to relegate the church to “profane but not sordid use,”) mass must at least be celebrated in it once a year, on the church’s feast day (according to past pronouncements of the Congregation for the Clergy.) Even without regular mass, such activities as the recitation of the rosary, or private silent prayer can still be held in an open church. Canon 1214 guarantees the faithful continued access to a church which remains open, regardless of the frequency of the mass schedule. Thus, it would be wholly inappropriate for Cardinal Dolan, a parish pastor, or some other official of the Archdiocese of New York, or another entity associated with it, to deny access to a church that is open, and has not been relegated to profane but not sordid use to those who wish to make use of the church for the purpose of religious devotion. The fact that all churches that have not been relegated to profane but not sordid use are considered under canon law to be open is summed up clearly in the church and parish closure guidelines of the Congregation for the Clergy, which state “Consequently, one cannot lawfully permanently close a church without first employing the provisions of Can 1222, Section 2, with the corollary that in the absence of applying the provisions of Can. 1222 Section 2, the church is to remain open. The financial responsibility of maintaining and preserving a church which is no longer the site of regular masses in order that it may remain a sacred space is without question that of those who wish for its continued existence as a Catholic place of worship. The Congregation for the Clergy has clearly stated that it is not the financial responsibility of the diocese or archdiocese in which a former parish church is located to maintain the church after the parish associated with it no longer exists. In fact, it is quite likely that over time, those churches which have been designated for occasional use will face permanent closure, sale and/or demolition if funding sources of a magnitude sufficient to ensure their continued preservation as Catholic sacred spaces are not developed. That being said, gathering the funds necessary to insure such a church’s preservation as a Catholic sacred space, while labor intensive, is not as complicated a task as it might appear to be at first glance. It must be remembered that New York is far from the first diocese which has undertaken a reorganization of its parishes. Some dioceses, especially in the middle and western portions of the United States, were forced to close parishes as far back as nearly a century ago. Soon after opening, some parishes were shuttered on account of towns not developing in the locations where it was believed they would take root, or due to the relocation of a railroad line. Even long ago however, parishioners saw the importance of preserving the churches associated with these closed parishes as sacred spaces, available at the very least for the occasional celebration of mass, and as memorials to the faith of those who labored to build them years before. Thus, in parts of the United States today, churches whose parishes closed as early as the 1920s remain preserved as Catholic churches, in which mass is celebrated several times per year. The question that is probably coming to mind at present, is how such a venture can be sustained, given that there is no active congregation on cite to fund the project through their weekly donations? The answer these early groups came up with was one which now more than ever is a beacon for all who desire to preserve long into the future historic if seldom used Catholic Church buildings. These early groups of parishioners formed preservation societies, organizations specifically established to raise the funds required to maintain the physical structure of the historic Catholic churches they cared for. Just as some preservation societies around the country maintain historic homes or former public buildings (such as historic courthouses,) these Catholic Church preservation societies raise the funds required to keep the church buildings for which they care in a state of good preservation. They cover the costs of utilities, pay the insurance on the church buildings, and raise the funds necessary for the repairs such buildings of advanced age frequently require. To raise the money required to undertake this type of project, the preservation societies spread the word among former parishioners of these churches and their descendants, including those who live both in the immediate vicinity of the churches, and those who reside in other parts of the country and world. These groups also invite those members of the community who would like to assist in keeping these historic churches alive as Catholic sacred spaces to donate toward the cause. Often, social events which double as fundraisers are also held, to bring together all of those who have great love for and attachment to the church which the group is preserving. These groups do this all with the cooperation of their diocesan bishops, in cooperative arrangements which in some cases stretch back several decades. The dioceses in which these groups are located have recognized the value in preserving historic Catholic churches as sacred spaces, both to insure these sacred spaces remain available for future generations, and to insure that those who hold great attachment to these historic churches are not needlessly injured by being unnecessarily deprived of these church buildings’ continued presence in their lives. As long as the upkeep of these churches isn’t costing the dioceses and parishes in which they are located anything, the powers that be in many dioceses have over the last several decades seen no harm in allowing these churches to continue to stand and remain tangible symbols of the Catholic faith in the world. 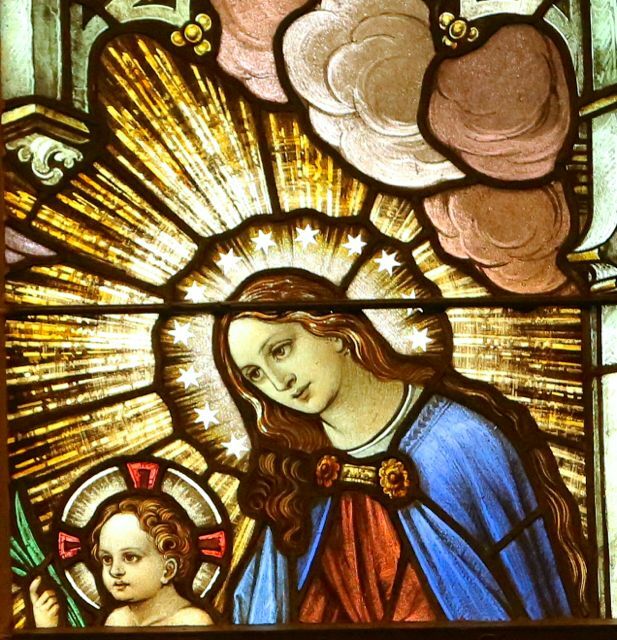 Today, there are more than forty Catholic churches, some used as infrequently as once per year for mass, preserved and maintained by Catholic Church preservation societies across the United States, from New York to California.. It should be stressed that when I speak of preservation, none of the groups I am speaking of has converted a church to a secular purpose, i.e. a community center or the like. Cardinal Dolan should be personally aware of the preservation of Catholic church buildings as a sacred space in this way, because three of the groups overseeing the preservation of Catholic churches are located within the boundaries of the Archdiocese of St. Louis, the ecclesiastical territory in which Cardinal Dolan was born, ordained a priest, and consecrated an auxiliary bishop. Cardinal Dolan also may be aware of the wonderful work carried on by Catholic church preservation groups because of the Friends of St. Ann, in the small community of Sawkill in Ulster County. It is there that one finds St. Ann’s Catholic Church. 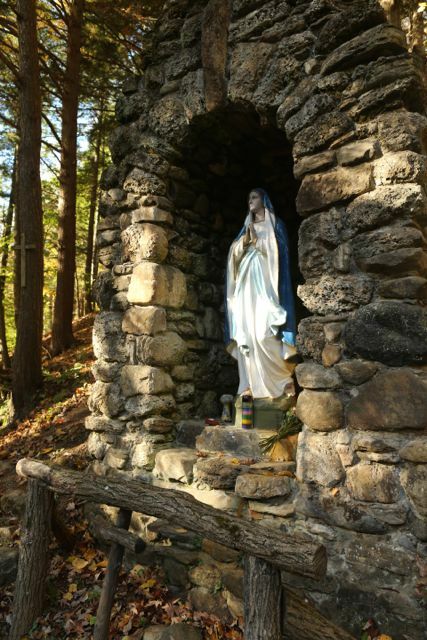 St. Ann’s parish was established in the late 1860s to serve Irish Catholics who settled in the Sawkill area. The present church, the third constructed during the history of the parish, was built in 1913, the same year the previous church was destroyed by fire. 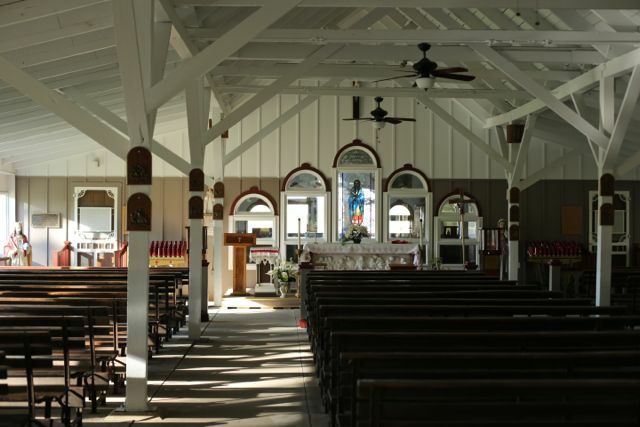 With a decrease in population in the area lying within the boundaries of the parish, St. Ann’s parish was merged into another parish by the archdiocese in 1961, and regular mass ceased to be celebrated at the church a few years later. That might have been the end for St. Ann’s church, and by the mid-1970s, it appeared it very well could be, as the church was showing signs of deterioration thanks to lack of upkeep. Former parishioners however were not content to allow St. Ann’s to fade away. 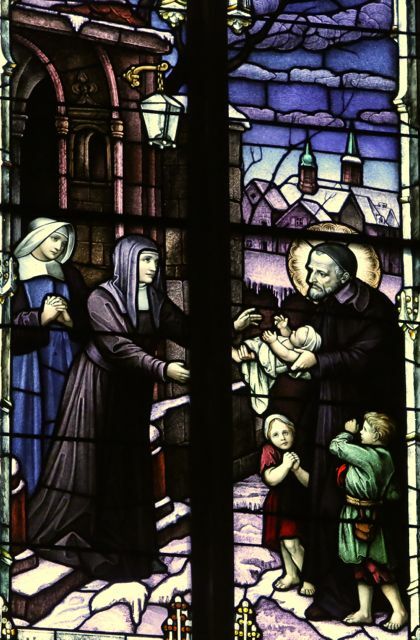 They started an organization, today known as the Friends of St. Ann’s, which over the course of several years repaired the church and which continues to this day to maintain the church in a state of good preservation. Their website can be found here: http://www.saintanns.org/friends_of_st_anns.html Mass is still celebrated at the church several times per year, and the historic church can be toured. 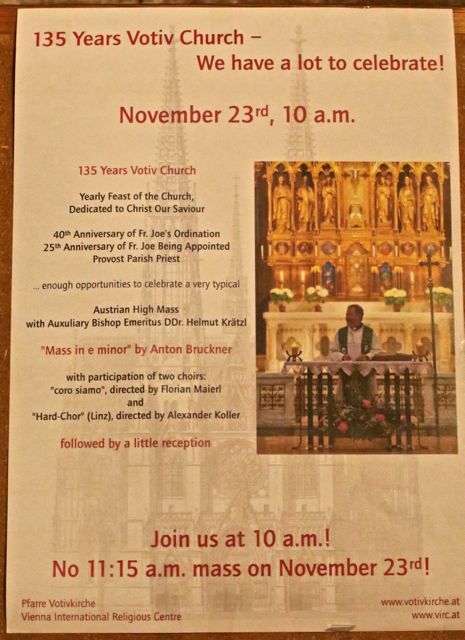 The success of the Friends of St. Ann shows that such a project can be carried out in the Archdiocese of New York, and their success should inspire others who would like to see their own church buildings remain sacred spaces, available for the celebration of at least occasional masses. The guidelines of the Congregation for the Clergy regarding under what circumstances a Catholic church building can be closed have vindicated the efforts of these early Catholic church preservationists, and led to the formation of several new Catholic church preservation groups over the course of the last year. These guidelines, and the work of those who have been preserving historic Catholic churches for the last several decades as sacred spaces, available for the celebration of occasional masses, have provided a template through which those in New York can keep the historic churches of the archdiocese preserved for at least occasional mass, for many decades to come. Through the establishment of a Catholic church preservation group, a funding source capable of supporting the continued maintenance of an individual church will be created that will not drain resources from the Archdiocese of New York, or the new parish in which the former parish church will be located. This guaranteed funding source, supported by those former parishioners of the church and others, both in the local area and outside of it who care about the church’s continued existence, will allow it to remain a Sacred space, available for at least occasional masses, private prayer, the recitation of the rosary, and such other activities as would not defame its sacred character. 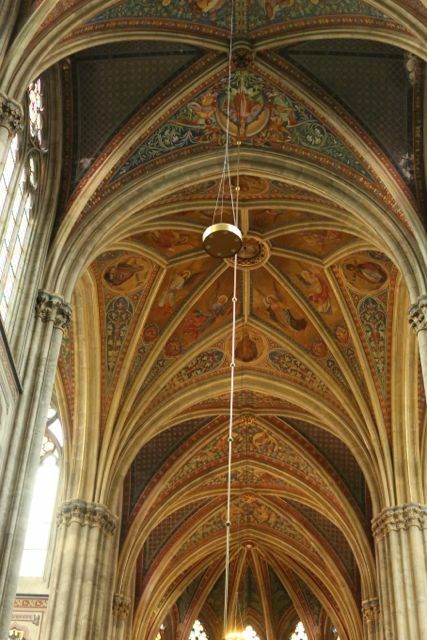 Such activities could include making the church available for occasional tours, as many of these churches possess unique and irreplaceable architectural elements and masterpieces of religious art. The successful precedents set by Catholic church preservation projects in other parts of the country, combined with the guidelines promulgated by the Congregation for the Clergy that encourage the retention of Catholic church buildings whenever possible, provide a clear illustration of how the formation of multiple church preservation societies could lead to the retention in sacred form of many of New York’s most historic and threatened Catholic churches. It is unclear to me on what grounds the Archdiocese of New York could object to the implementation of preservation plans such as have been outlined above. It might be the case that objections would be raised at the expending of such large sums of money on preserving “buildings,” either on the grounds that those who wish to expend them should not be permitted to “waste” their money in this manner, or that such funds would be better spent on some project or another of the surviving parishes, or of the archdiocese itself. 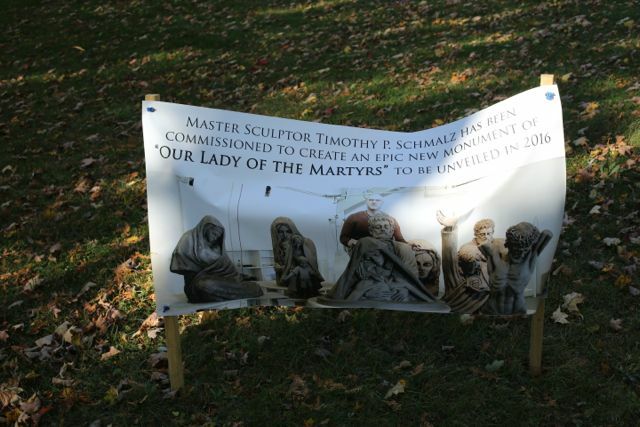 Aside from reminding anyone who wishes to criticize such a project as has been outlined above on these grounds that it is the right of parishioners who feel inspired to undertake such a venture to do so, it should be further pointed out that there is no guarantee that any of the money which might be devoted to such another project as the Archdiocese might wish it to be directed would in fact be donated to that project. It is generally the case that those who open their wallets to preserve a historic church building are doing so, not out of a general desire to aid the church universal, but to help the universal message of the church be spread through the retention of a tangible aspect of its presence in a particular area, i.e. a historic church building. Thus, it is unrealistic to argue that the preservation of a church building drains resources away from projects where they might otherwise be directed. It would be truly unfortunate were any objections to the undertaking of such church preservation efforts, regardless of the form these objections might take, in truth be put forward based on a desire to reap the monetary benefits that could be gained from selling off church property, some of which might be of great value. It appears this practice may have been one of the central causes behind the Congregation for the Clergy’s decision to issue the instructions on parish and church closure it promulgated in 2013. Recent rulings by the Congregation for the Clergy would seem to favor our analysis. In the city of Buffalo is located the historic Catholic church of St. Ann, formerly the seat of a German personal parish, built in 1886. St. Ann, a massive church which can seat 1500 people, was targeted for closure by the Diocese of Buffalo several years ago. After staving off closure for a number of years, the church was shuttered in 2012. 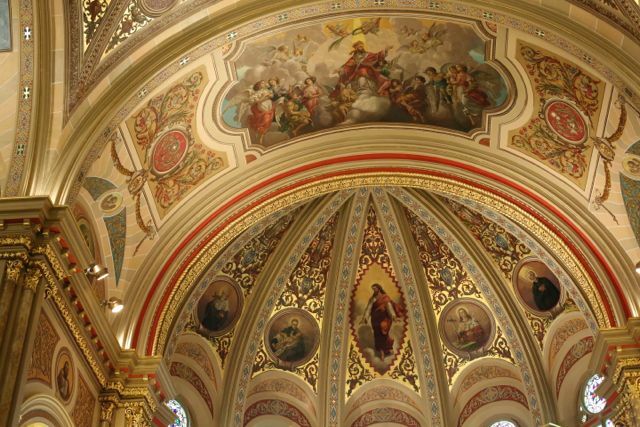 The Diocese of Buffalo argued that St. Ann’s required millions of dollars in repairs, and that neither it nor the parish into which St. Ann was merged had sufficient resources to undertake the repairs the church would need. 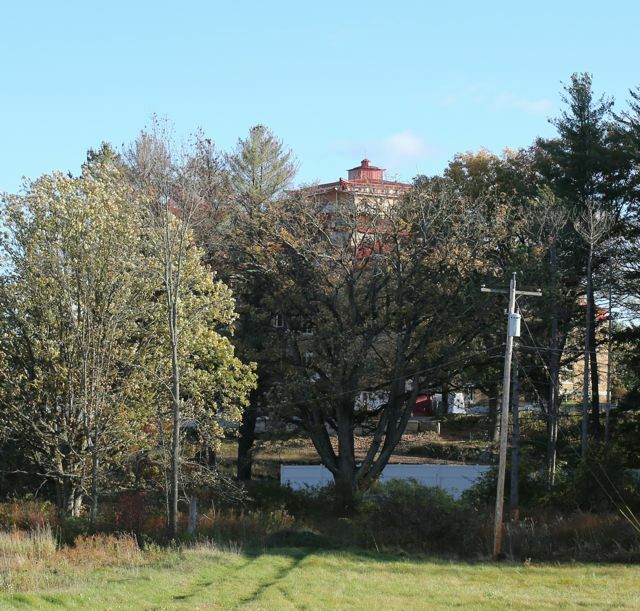 The diocese, seemingly in an effort to blunt any opposition to its decision, attempted to engage secular developers to preserve the shell of the church in some future repurposing of the site. Tying the preservation of a church building to its forced secularization angered many St. Ann church parishioners, as it should have! Descendants in many cases of those who built the church, these faithful Catholics and their supporters thought it completely unacceptable for St. Anne’s church to be permanently closed and converted to a secular purpose or demolished (demolition being the other idea for the church’s future put forward by the Diocese of Buffalo,) when such a committed group of people existed to restore and maintain the church. 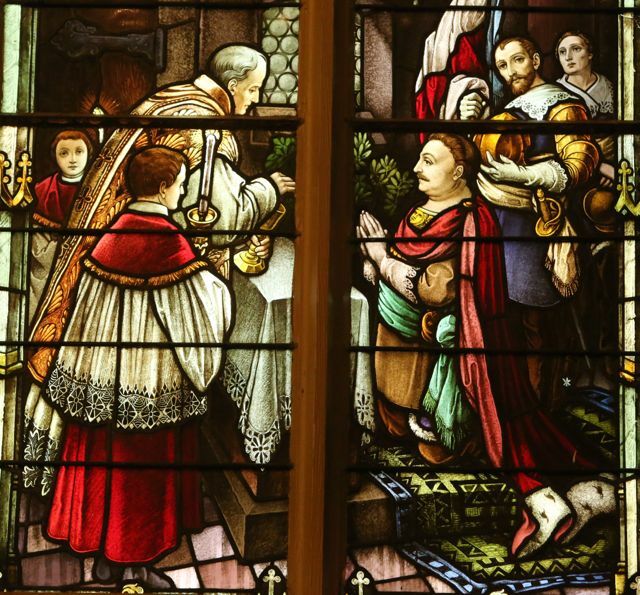 Forming the non-profit “Friends of St. Ann’s,” the parishioners appealed the decree issued by Bishop Richard Malone relegating St. Ann’s church to profane but not sordid use. In January 2014, the Congregation for the Clergy reversed Bishop Malone’s decision, and ordered that St. Ann’s church remain a sacred place of worship. The congregation held that the Friends of St. Ann had the right to restore and maintain the church, and that they had demonstrated they were capable of formulating a plan to undertake those repairs which would be necessary to restore the church over a period of time. While each case the Congregation for the Clergy hears is decided on its own merits, the decision in the Case of St. Ann’s church in Buffalo can be said to show that a well-organized Catholic Church preservation group has the right to take responsibility for the long-term preservation of a Catholic church as a sacred space, available for at least the occasional celebration of mass. While the preservation of a church building, without the fully active parish once associated with it also being preserved may seem like a worthless gesture on the part of some, several things should be taken into consideration. While the weekly mass, and the community of believers who attend it is obviously important to the parishioners of any particular church, it must be remembered that the sacred character of a church building is what must above all else be protected and preserved. Churches by their very nature, as consecrated spaces, have been elevated to a state of being which far surpasses that of any other structure, as they are set aside for the glorification of God. The least we can do as their parishioners and thus their custodians, is to not abdicate our duty to insure that they continue to exist as God’s houses on earth by walking away from them in their greatest hour of need, regardless of what present limitations may exist concerning their regular usage. It should also be remembered that these churches were the ultimate tangible expressions of piety on the part of those Catholics who constructed them, and in ages past brought the faith to New York, and following its arrival, did all in their power to insure it took root. At the time of their construction, it is doubtful that any of those who gave so generously from what little in the way of resources they had could have conceived of the idea that in an age when the overall Catholic population is in possession of vast amounts of wealth and power, these sacred churches would be cast on to the rubbish pile of history. The continued existence of church buildings, even if they only are sites of regularly scheduled private prayer and occasional masses can be of great comfort to those whose families have attended them for generations. Many people involved in church preservation efforts speak of the great piece they feel from knowing that they are insuring through their hard work the continued existence of a sacred space their ancestors constructed with such reverence. Finally, the situation as it exists in Rome itself should be considered when looking at the Catholic churches of New York. Over the centuries, many hundreds of churches have been constructed within the limits of the eternal city. Some of these churches only host public masses, and are only open to the public on special occasions, such as certain feast days. None the less, these churches are still preserved as sacred spaces. A number of these churches, serving as the titular churches of cardinals, are supported in their continued existence at least in part through funds raised by the cardinals whose care they have been in trusted to. Thus, an example of a city containing historic churches, supported in part through donations of those who do not live in the immediate area surrounding them, is one which has been embraced for some time for the care of churches lying directly in the shadow of the Holy See. Cardinal Dolan himself was assigned such a “titular church” when he was created a cardinal. The permanent loss of one’s church is something from which many never truly recover. 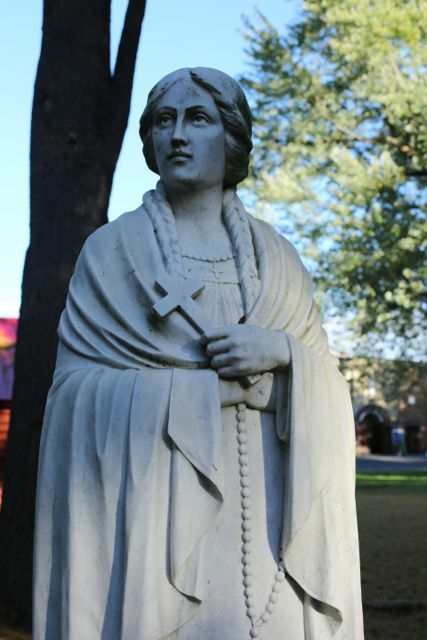 It is a pain which is often needlessly inflicted upon those who far too frequently lack the tools to defend themselves from it, on account of their lack of knowledge regarding the rights church buildings enjoy under canon law and of how to undertake their preservation as Catholic sacred spaces. I can say from personal experience that the only thing worse than losing my church has been the loss of several family members during the course of my life. A church is one’s spiritual home. It is the location of the most personal religious moments in our lives and those of our family members. It is the physical place on earth where we find ourselves closest to God. In Boston, the closure of dozens of churches has deprived the Catholics of the city of many spectacular and historic churches, the likes of which will never again be built in this nation. One of the most unfortunate losses in the Boston church closure program was the Church of the Holy Trinity, a German ethnic church constructed in the city’s South End by Patrick Charles Keeley and opened in 1877. Without doubt, there are many examples of churches of the caliber of the Church of the Holy Trinity which are threatened at this moment in New York. If the people of the Archdiocese of New York do not step forward and care for their churches in this their greatest hour of need, the probable sterility of the Catholic architectural landscape in New York City and parts surrounding several years after the implementation of Making All Things New is frightening to consider. Cardinal Dolan, in discussing Making All Things New, stated that with regard to planning, we should be asking whether something is “just about today,” or “conscious of tomorrow?” It would be truly horrific were we to cast aside the treasures which are New York’s Catholic churches due to the current financial condition of the archdiocese, the pastoral sensibilities of its leaders, and because its Catholic population did not stand up and defend them. That would show a complete lack of concern for the generations who will follow us, who have just as much right as all of us now living to enjoy the historic Catholic churches of New York. Let us pray that together, we can plan for the continued existence of New York’s historic Catholic houses of worship, and prevent their senseless and needless destruction. When one thinks of New York, the first images which come to mind may be those of the Empire State Building or the Statue of Liberty. These gigantic structures certainly stand as iconic symbols of this cosmopolitan metropolis. When I think of New York, however, my mind immediately turns to a less secular, but no less important set of structures, the multitude of Roman Catholic churches which are such an integral part of the city’s Catholic patrimony. 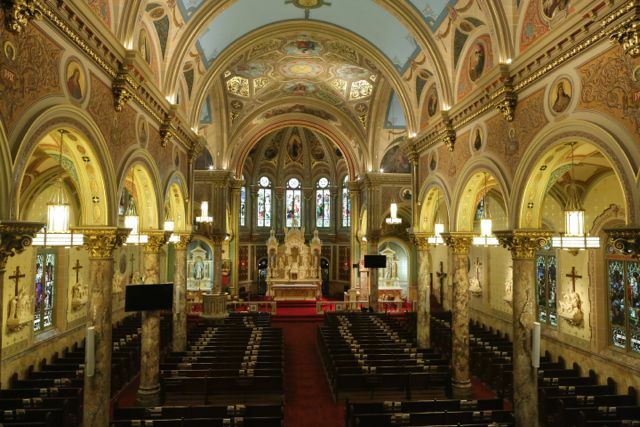 These glorious religious buildings, different in design but singularly representative of the devotion of New York’s early Catholics are irreplaceable religious and cultural treasures, and are without question collectively a constituent component of the city’s majesty. These churches serve for Catholics as a tangible manifestation of so much of what New York is; America’s gateway city, an ethnic and geographic melting pot which has collected people from all corners of the globe, and retained them, to create a dynamic society like no other. The Catholic churches of New York make up a brilliant tapestry, resplendent with the threads of so many different ethnicities, each of whom felt it important to contribute a house of God particular to its cultural sensibilities to the city’s religious landscape. In so doing, the progenitors of New York’s Catholic population have passed down to us a collection of religious edifices, different in construction yet assembled within one city, the existence of which should bring a cheer to the lips of every Catholic New Yorker, including the shepherds of the local church. Unfortunately, several circumstances have now brought the leadership of the Archdiocese of New York to engage in an exercise entitled, “Making All Things New,” a process designed to realign the boundaries of many of the Archdiocese’s parishes. The specifics of this plan were released last November by the Archdiocese, and it seems another round of decisions will be made early this year. The issues surrounding Making All Things New are currently receiving considerable coverage by the media, the Catholic and secular press alike. I think it is exceedingly important at this time, when parishioners are experiencing so many emotions on account of the content of Making All Things New, to carefully break it down, and discuss what Cardinal Dolan has done and what he has not done. In doing so, a better understanding of the full and true meaning of this plan can emerge and hopefully guide parishioners in their responses to it. I seriously question the archdiocese’s decision to extinguish multiple financially solvent parishes, as these vibrant faith communities are the hallmark of a healthy local church. That being said, when the results of this process are compared to those which were carried out in Boston and other locations in decades past, the decisions arrived at under Making All Things New are on their face less draconian. If in the coming months these decisions are implemented sensibly the years long battles which have been seen in many other American dioceses might be avoided. This essay will focus on implementation at a later point, for the moment, let us look at what Making All Things New has actually done. While surely no parishioners are happy about having regular mass end at some churches (having experienced this myself, I understand the pain this change brings) it must be understood that Making All Things New DOES NOT in and of itself order the “closure” of any churches within the New York Archdiocese. It is still very possible for any parishioners who are committed to the continued existence of their church as a Catholic sacred space and continued place of at least occasional worship to insure that it will remain so, long into the future. The downgrading of a church to a place of only “occasional” worship is not merely the final step before it goes over the cliff of permanent closure. In many American dioceses in years past, the reduction of a church to the site of occasional masses almost certainly tolled the death knell for that particular place of worship, an act likely to be soon followed by its sale and/or demolition. Things have changed however since the last round of parish consolidation that took place within the Archdiocese of New York in 2007. Since early 2011, Rome has been more closely monitoring the decisions of bishops to permanently close church buildings at the same time parishes are merged. The Vatican, having noticed that many bishops in the United States and other parts of the world were improperly closing church buildings and subsequently selling them off, made clear its preparedness to enforce the specific rules under Canon Law (the code of laws that govern the administration of the Catholic church,) related to the closure of churches, and reverse such closures when they are inappropriate. Since 2011, the Vatican has reversed the closure of twenty-three church buildings in six dioceses in the United States. In addition, the decision of a bishop in the United Kingdom to close a church has also been overturned. The additional scrutiny being applied to the closure of church buildings gives parishioners of “occasional use” churches in the New York Archdiocese a chance many in other locations would have jumped at in years past to ensure that their beloved spiritual homes may remain available as places of religious devotion to generations as of yet unborn. In order for these churches to survive though, actions must be taken now, to insure that churches will remain standing later. Before I explain what those actions are however, it is essential that anyone reading this essay first step back, and familiarize themselves with the key concepts which underpin all that is being discussed here. In the documents related to Making All Things New, there are many references to “parishes” and “churches.” It is thus important that we understand what the definitions of “parish” and “church” are in Canon Law, as these definitions are key to understanding the different rights under Canon Law each of these entities possesses. While we often interchange the words “parish” and “church” when referring to a Catholic place of worship, these two terms have entirely different and very specific definitions. The definitions of each of these terms are found within the Code of Canon Law, conveniently posted on the website of the Vatican. 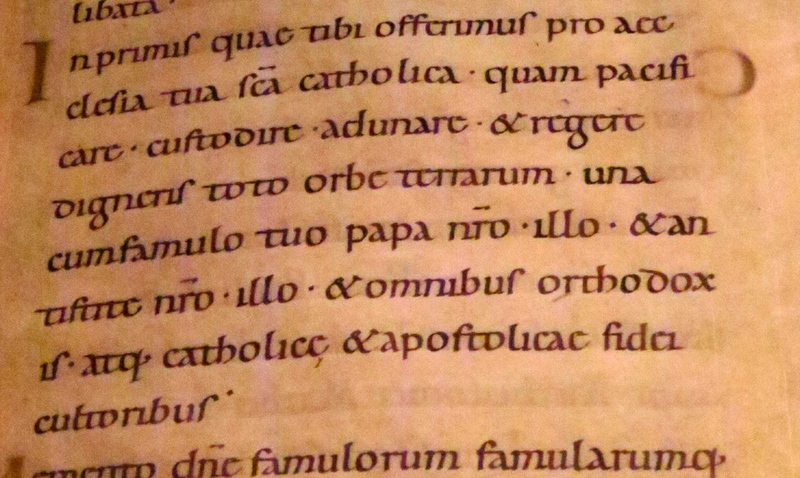 When one examines the canons, one finds the definition of a parish in canon 515 §1. “A parish is a certain community of the Christian faithful stably constituted in a particular church, whose pastoral care is entrusted to a pastor (parochus) as its proper pastor (pastor) under the authority of the diocesan bishop.” In layman’s terms, a parish is a community of Catholics who happen to worship at a particular church, and who are cared for by the pastor of that church. The “parish” is not however the church building itself. There are several different types of parishes. Canon 518 states, “As a general rule a parish is to be territorial, that is, one which includes all the Christian faithful of a certain territory. When it is expedient, however, personal parishes are to be established determined by reason of the rite, language, or nationality of the Christian faithful of some territory, or even for some other reason.” This separates parishes into two distinct types, territorial parishes and personal parishes. A territorial parish has boundaries that are drawn on a map, just as the boundaries of a town, city or state are drawn on a map. All of the Catholic faithful living within the lines drawn on the map to constitute the parish boundaries are within the borders of the territorial parish. A “personal parish,” is a different kind of parish. As Canon 518 states, this type of parish is not based on territorial lines drawn on a map, but is instead based on some common characteristic that a particular subset of the Catholic population shares. 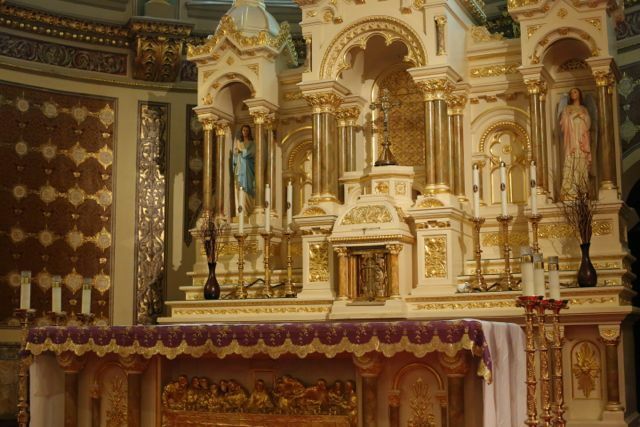 It could be that a parish is established for all of the Catholic faithful in a community or part of a community who speak Polish or French, or for all of the faithful who have an affinity for the celebration of the Tridentine (Latin) mass. Regardless of the reason for a parish’s foundation, all parishes are established in the same way under canon law. While it is true that all parishes have at their center the parish church, it is an entirely different canon which defines the church building, and yet another which governs the circumstances in which it can be closed. A standard response to the question “what is the church” is the body of believers which constitute the people of God. While this might be an accurate description of the church universal, such an answer does not accurately define a church building itself. In order to understand what a church building truly is, and the importance of its sacred character, we must turn to Canon 1214, which states “By the term church is understood a sacred building designated for divine worship to which the faithful have the right of entry for the exercise, especially the public exercise, of divine worship.” In this short definition, one finds an enormous amount to dissect and understand. We see first that a church isn’t just any building, but a “sacred building.” The sacred character of a church thus tangibly separates it from the other buildings which might be frequently visited by Catholics, i.e. one’s personal residence, place of work, and centers of recreation regardless of type. While mass can be and has been celebrated in such places as Yankee Stadium, it is the church building in which the holy sacrifice of the mass and other sacramental actions of the church are to be ordinarily celebrated, owing to the sacred character of the space. This point is further illustrated by Canon 1214’s admonition that a church is “designated for divine worship.” We also learn from Canon 1214, that the faithful have “the right of entry” to a church. The importance of this piece of the canon will be discussed later, but this fact, combined with the canon’s statement that this right of entry exists for the exercise of divine worship, are key points to understanding what a church building is and how it is to be used. Just as a careful reading of the applicable canons clearly shows the difference between a parish (regardless of the type of parish,) and a church building, so too is it the case that different canons must be applied to close a church building than must be applied to eliminate a parish. It is for these reasons that when it is said that a parish is being “merged,” or “closed,” (parishes should almost never be “closed,” as “suppression” of a parish is almost never appropriate,) it must be understood that the automatic closure of the church building(s) associated with that parish are NOT necessarily to follow. This is on account of the fact that the reasons which justify the permanent closure of a church building differ in type and level of required seriousness from those which would allow for the combination of parishes. In years past, it was the case that in some dioceses, “ordinaries” (the official title for the bishop or archbishop of a diocese or archdiocese,) simply closed and sold church buildings at the same time the parishes associated with those church buildings were eliminated, seemingly ignoring the particular parts of Canon Law that applied to the closure of church buildings. The canonical problems associated with the taking of such actions led the Vatican’s Congregation for the Clergy, the Vatican department responsible for handling matters associated with the closure of parishes and churches, to issue a set of guidelines to the bishops of the world with regard to the closure of parishes and churches, in order that any confusion associated with these undertakings as to what can be closed and when might be eliminated. It is good to see that the Making All Things New process follows the guidelines that the Congregation for the Clergy promulgated. This document, entitled “Procedural Guidelines for the Modification of Parishes, the Closure or Relegation of Churches to Profane but not Sordid Use, and the Alienation of the Same,” was issued by the Congregation for the Clergy on April 30, 2013, and signed by the Congregation’s prefect at the time, Mauro Cardinal Piacenza. While this document addressed several points, its main purpose was to explain in careful detail the difference between the closure of a parish and the closure of a church, and the circumstances under which each action can be taken by a diocesan bishop. The guidelines show that while it is Canon 515, Section 2 that governs under what circumstances a parish can be extinguished; it is Canon 1222, Sections 1 and 2 that controls in situations when the question of permanently closing a church building arises. Just as different canons apply to these different questions, different reasons, and gradations of reasoning are required to effect either course of action. A bishop can only close a parish, (i.e. combine its territory with that of another parish, or in the case of an ethnic parish, cause it no longer to exist,) when a “just cause” is present. The term “just cause” here is key. A just cause for the purposes of combining parishes could embody a range of meanings, and the conditions that precipitate the combination of parishes do not have to exist solely within those parishes being combined. Examples of just causes would be a shortage of priests, the inability of the parish to financially sustain itself, or any number of other circumstances which could logically lead a bishop to determine that it would be in the best interest of the faithful in his diocese to combine certain parishes. Such reasoning might not be shared by those whose parishes are being combined, but it has historically been the case that Rome has allowed bishops a wide latitude in determining under what circumstances parishes in their dioceses should be combined. Rome has however in recent years treated the closure of church buildings themselves in a far different manner than it has dealt with the extinguishing of parishes. In its guidelines of 2013, the Congregation for the Clergy restates that “in law and tradition,” there is a “clear disposition” that a sacred edifice should retain its “sacred character, if at all possible,” and that only a “grave reason” can justify the relegation of a church building to “profane but not sordid use.” To put this in layman’s terms, without the presence of a “grave reason” justifying its closure, a church building is not supposed to ever be closed, regardless of whether or not the parish with which it was originally associated has been or will be closed, or how frequently mass is celebrated within it. A “grave reason” is not merely any reason that a diocesan ordinary might wish to employ to justify the permanent closure of a church building. Based upon the text of Canon 1222 and the guidelines the Congregation for the Clergy issued in 2013, there are generally two causes of sufficient gravity which justify outright the permanent closure of a church building. These are that the church itself has been damaged to such an extent that it is completely beyond the point of repair, and that no sources of financial support of any kind are present that would allow the church building to continue to be maintained. A bishop who wishes to use a claim of insufficient financial support to justify the closure of a church building must show that no other “reasonable sources of funding or assistance,” including “private” funds, are present that could maintain the church building. Thus, even if a parish itself is unable to support the continued existence of a church building, another source of financing which could insure the church would be maintained and preserved as a Catholic sacred space has the right to step in and do so. While it is true that other reasons which in and of themselves are not of sufficient gravity that they would justify the permanent closure of a church building on their own can in combination serve as justification for the taking of such an action, it seems likely that a group of persons dedicated to a church’s preservation as a sacred space, available for at least occasional religious use could overcome attempts to employ such reasoning. In attempting to convey the point that a church building, regardless of how occasionally mass may be celebrated within it, should not simply be automatically closed at the time parishes are combined, the Congregation for the Clergy lists a number of reasons which in and of themselves DO NOT constitute reasons of sufficient gravity to justify the permanent closure of a church building, including “I, a general plan of the diocese to reduce the number of churches, II, the church is no longer needed, III, the parish has been suppressed, IV, the number of parishioners has decreased, V, closure will not harm the good of souls, VI, a desire to promote the unity of the parish,” and “ VII, some potential future cause which has not happened yet.” The fact that the Congregation for the Clergy takes such pains to set forth in its guidelines that these reasons should not be sited by themselves as justification for permanently closing a church building reinforces the point that the closure of a church building is supposed to be avoided whenever possible, making it an altogether different action than the mere combination of parishes. The inherently sacred nature of a church building means that it enjoys a far greater degree of protection under canon law than does a parish, and Rome is making it clear that this sacred character of churches should be preserved if at all possible, and that it is willing to intervene if necessary to protect the sacred character of church buildings. At this point, many readers may be asking how all of this relates to the current effort of the Archdiocese of New York, through its Making All Things New process, to reshape itself? While I am not a canon lawyer, I would say the following, based on 10 years of observations of the processes dioceses and archdioceses have employed to combine parishes and close churches, and my analysis of the decisions handed down over the past 10 years by the Vatican’s Congregation for the Clergy and Apostolic Signatura in cases of parish and church closures. Given the Vatican’s recent pronouncements on how it is interpreting Canon Law with regard to the closure of parishes and churches, Cardinal Dolan will likely prevail in any action brought to challenge his decisions to combine several parishes into one new parish. In some situations, where individual parishes have shown they are unable over the long term to pay their expenses, this may make sense. While I would personally question the wisdom of merging parishes which are financially solvent, it is likely that in either case the Cardinal’s decisions will be upheld on appeal. The same is not automatically true however for decisions which might be made in the future to permanently close church buildings themselves. If one looks at the decisions released in November, one will find that churches whose parishes were being eliminated were grouped into two categories. There are those churches which will serve as fully functioning worship sites, with regularly scheduled masses. The second category contains churches at which “masses and the sacraments” will no longer “be celebrated on a weekly basis,” but which remain churches and can still be used for “special occasions.” It is thus spelled out clearly, in the Archdiocese of New York’s own announcement of the results of the Making All Things New Process that no church buildings are being ordered to close at this time. This is a major point, and it is essential that parishioners of churches affected by the Making All Things New process understand it. If anyone who wishes for their church building to remain a Catholic church in the long term takes the steps necessary to make that a reality, the Archdiocese of New York is, at least on paper, giving them the opportunity to do so. While the results of the Making All Things New process, on paper at least, look to be an improvement over some past diocesan reorganization projects, as they say, the proof of the pudding is in the eating. Having followed the evolution of the Making All Things New process since its inception, I remain concerned by a few points. In past pronouncements related to Making All Things New, Cardinal Dolan has appeared to employ the word “parish” in its nontechnical sense, or at the very least not to have clarified the context in which he is using the word. In his address to the clergy and religious of the Archdiocese of New York, delivered on June 6, 2013 at St. Joseph’s Seminary in Dunwoodie, Cardinal Dolan stated, among other things, that there are “too many parishes!” (Emphasis original,) that “we no longer need 385 parishes!” (Emphasis original,) and that a “lopsided amount of money” is dedicated to maintaining “parishes and buildings we no longer need.” Is his eminence referring to their being too many “parishes,” or does his eminence object to the number of church buildings which exist within his archdiocese? While it is accurate that the Archdiocese of New York cannot be forced to spend money to maintain occasionally used churches in the long run, is His Eminence prepared to follow the Congregation for the Clergy’s guidelines and allow parishioners to organize groups dedicated to caring for these churches, as is their right, should they wish to do so? Time will tell. Another point of concern to me regarding Cardinal Dolan’s willingness to cooperate with any parishioners who desire to preserve their occasionally used churches as sacred spaces in the long term stems from a statement he made in his pastoral letter “Pastoral Letter on Making All Things New,” issued on October 3, 2013. In this letter, Cardinal Dolan states that it is “likely” that the “pastoral planning process” will produce “unused properties, that could eventually be sold.” While Canon 1222 does not prevent a bishop from selling parish buildings that are not churches, does Cardinal Dolan intend to try and prevent church preservation efforts, should they arise, in order to justify selling church buildings themselves? I don’t know, and I will not predict the future here by speculating on what Cardinal Dolan will do. The way the Making All Things New process is implemented in the coming weeks and months, and the actions the Archdiocese of New York takes in the years to come will answer many of these questions. 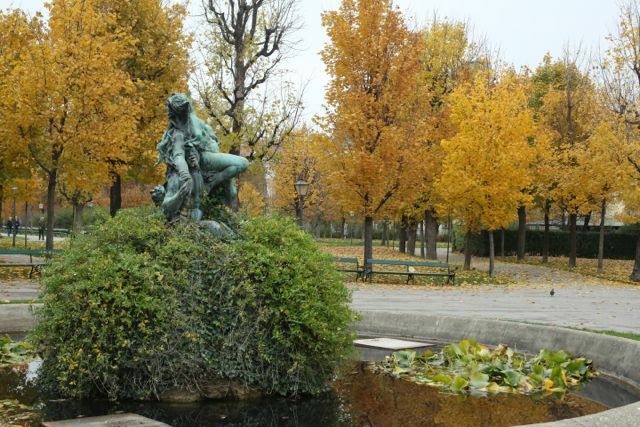 Winter in Wien – or at least late autumn in Vienna – a somber time of gray skies, chill winds and frequent drizzle. 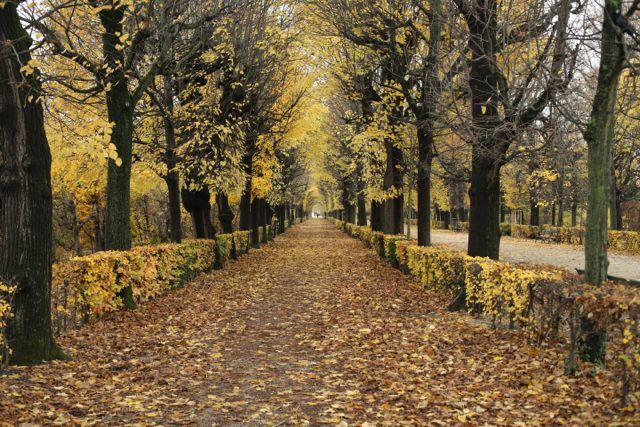 The dismal weather and the falling leaves prompt thoughts of death, of the end of things – so different from the frequent brilliantly clear, joyous days of Fall in the Northeast United States leading up to Thanksgiving. Yet the lights that begin to appear in early November at the Christmas markets scattered all over Vienna make all the stronger impression contrasted with the increasing gloom. You can get a real sense here why Christmas took on such extraordinary importance in the German lands. Winter in Wien is the title of the last book written by Reinhold Schneider, a leader of the “Catholic Literary Renaissance “ in Germany. Written in 1957-58, it is a diary of a lengthy stay by the author in Vienna, at a time when the raw memories of the catastrophe of World War II and the fears of potential apocalypse of atomic war were very much alive. Winter in Wien is a dark, even despairing work, deeply pessimistic about the future of Man. Vienna, a place where the great course of European history seemed to have come to a final end, naturally lent itself to reflections on the last times. And Reinhold Schneider – like most authors of the Catholic literary Renaissance – was naturally a man fascinated by the extremes of human behavior– sacrificial resistance, heroic stances, dramatic conversions. 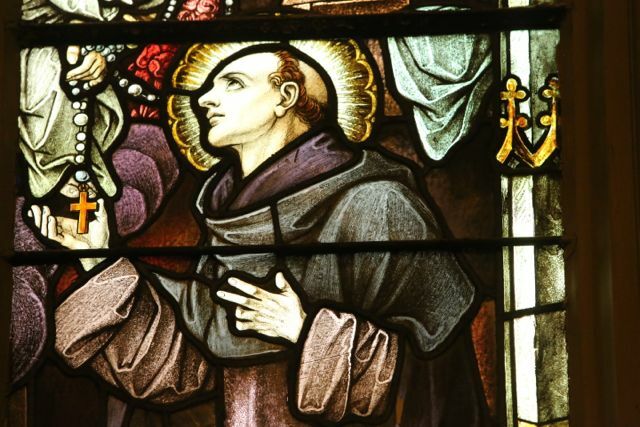 He had written a memorable novella on Bishop Bartolome de las Casas; he had published underground essays of theological consolation during the National Socialist regime. In the bleak pages of Winter in Wien Schneider meditated on the end of civilizations and of history. Today, decades of EU prosperity have transformed Vienna into one of the minor outposts of the New World Order. The slovenly, casual dress of almost everyone is striking; you get the sense that 1970’s American fashion has been elevated into a uniform here. One evening, one of the main TV channels shows a film on the great poet Trakl, graphically depicting an improbable love affair with his sister; there followed a movie on the saga of an aging prostitute (a transvestite? – I didn’t watch long enough to find out.). A Volksoper production of Puccini’s Turandot has all the singers dressed as insects. 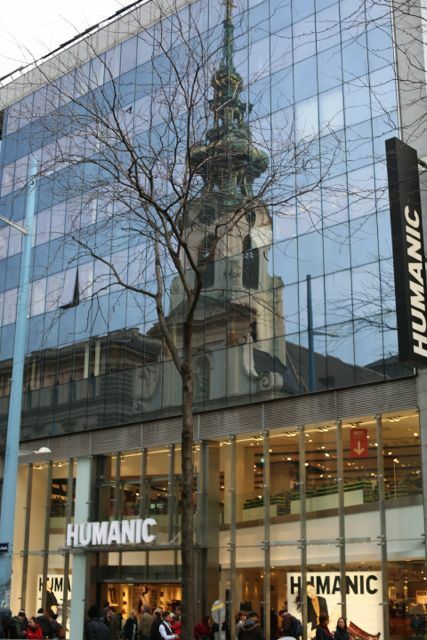 (Above) The baroque Mariahilf church reflected on one of the stores of Vienna’s main shopping street. It’s all a strange contrast with ball dresses on display in the windows. They testify to the continuance (for tourism’s sake?) of social rituals whose purpose disappeared ages ago. Indeed, almost everything of interest here belongs to the past; the magnificent Habsburg art collections, the oversized buildings on the Ringstrasse, the many magnificent baroque churches, the musical life in the opera houses, churches and concert halls. Western Europe as whole is living off the legacy of an earlier age but nowhere can this be sensed as strongly as in Vienna. The Austrian Republic and the European Union have created nothing here. (Above) The University – and the Jesuits’ – church, with the new and old altars. Neither has the Conciliar Church, whose ravages are nowhere greater than in Austria. 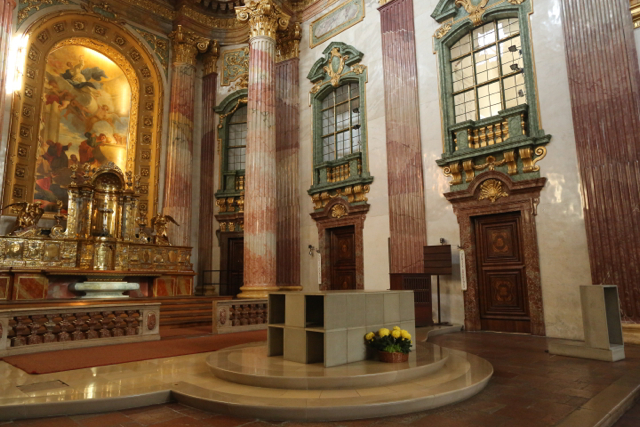 50 years ago 90% of the population of Vienna – even if never a hotbed of the faith in recent generations – still identified themselves as Catholic. Today it is 40%. Religious practice is far less than what that percentage implies. In a magnificent baroque church one encounters only one or two visitors at any one time – half of them tourists. Sunday masses of the churches of the center of town are frequented mainly for the music. 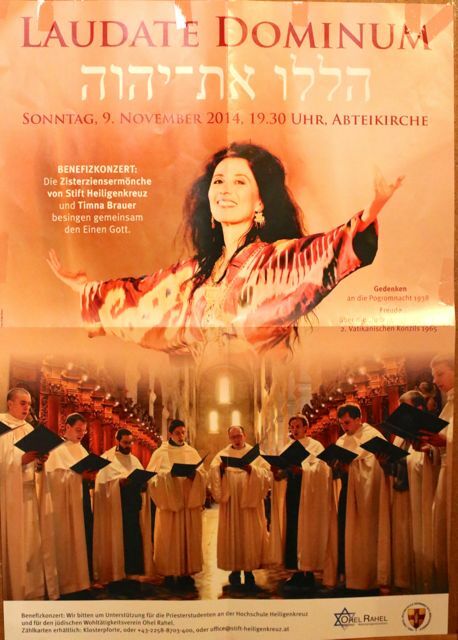 Again, one encounters the trappings of the past –the magnificent architecture, the masses of Mozart, Haydn and Bruckner, the splendid vestments – in a new environment entirely foreign to the culture that created them. 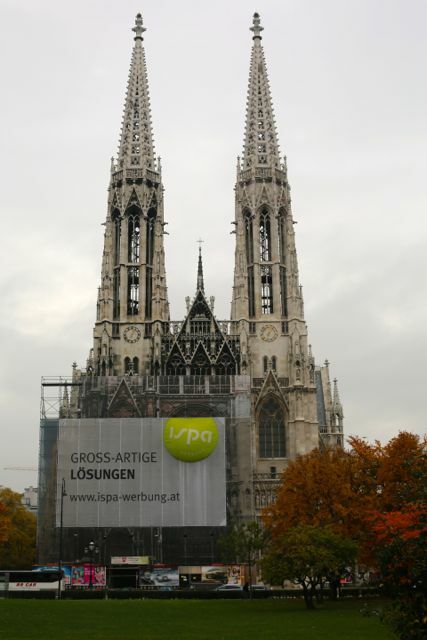 (Above and Below) the Votivkirche. Has hardly one knee bent in true devotion. 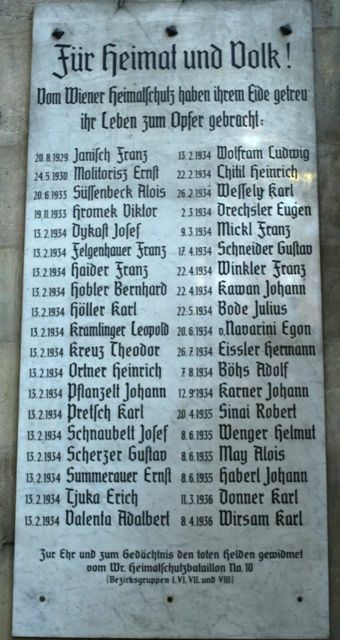 The Votivkirche also had important connections with the Austrian military. All around the church are commemorative plaques and monuments – the legacy of two terrible world wars. And after World War II, the republic of Austria smeared its partisan political messages on the windows and walls of this church. (Above) This plaque commemorates not soldiers in one of the two world wars but militiamen fighting a leftist uprising in 1934 – and perhaps others who died fighting a National Socialist coup attempt. (Above) In the Votivkirche. 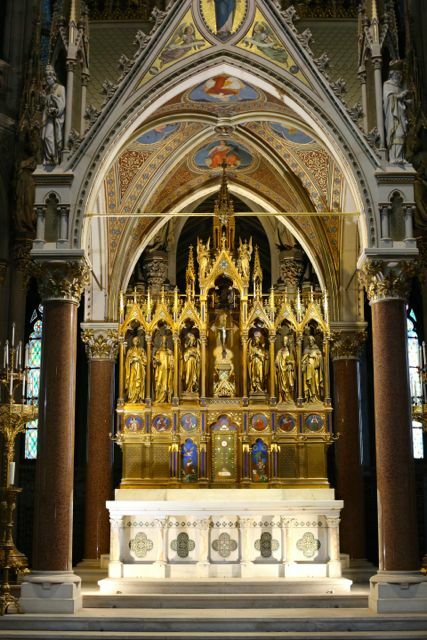 (Below) The magnificent old main altar. 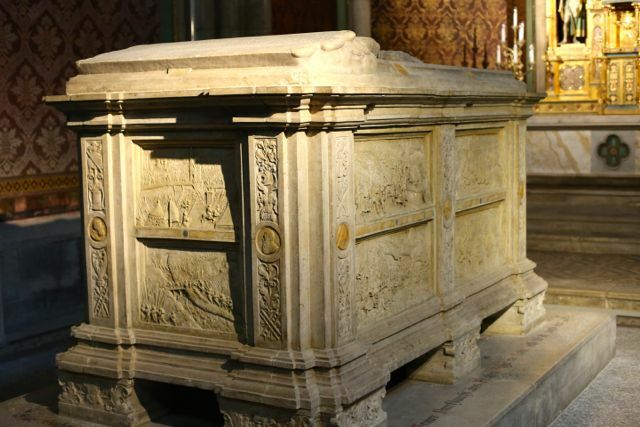 (Above) The renaissance grave (moved from a destroyed church in Vienna) of Count Nicholas von Salm, the heroic commander during the first siege of Vienna by the Turks in 1529. But the post-war years have not been kind to the Votivkirche. 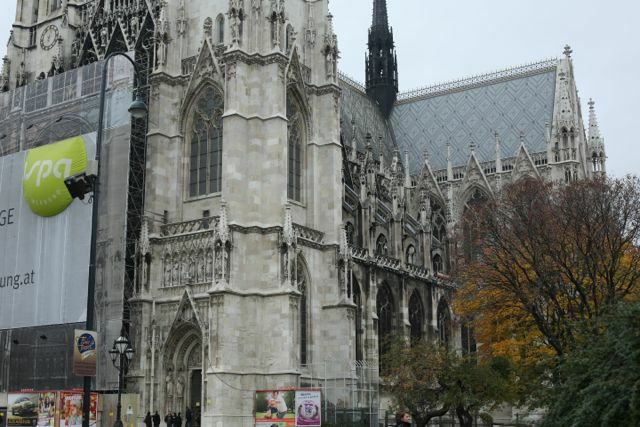 In contrast to the baroque churches of Austria, nineteenth century neo-gothic architecture was held in contempt. 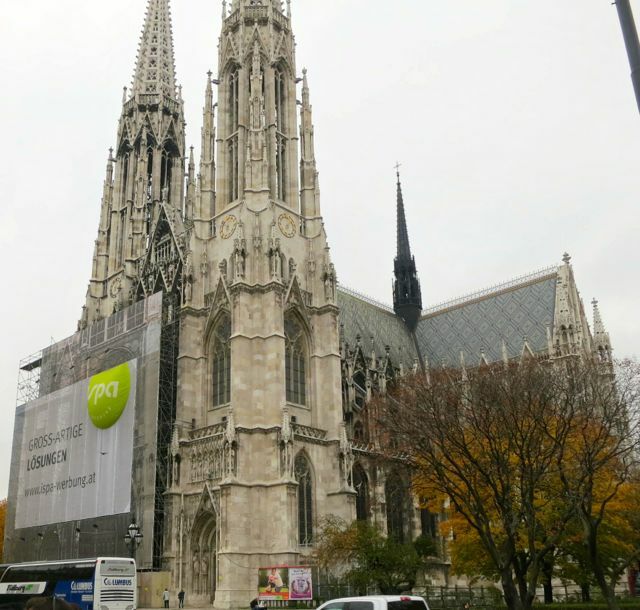 Signs of neglect are everywhere, and the scaffolding outside the church serves as a welcome billboard leased out by the Archdiocese of Vienna. The congregation of this church, still sizable in 1950, has also dwindled away. 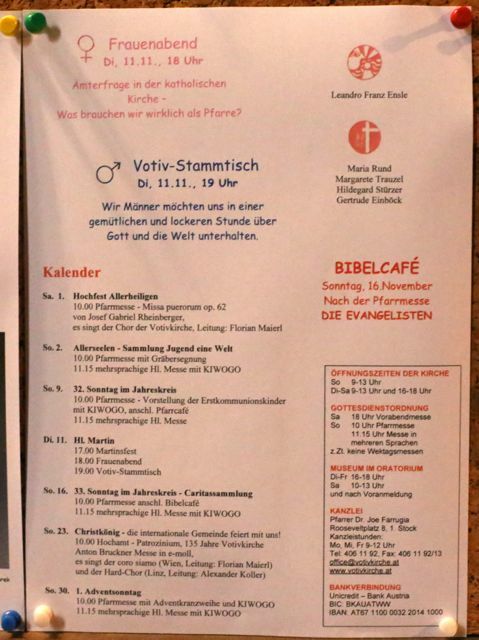 Now it is the seat of an apostolate to foreigners in Vienna, led by “Father Joe” (naturally not an Austrian). (above) An “evening for women” on “the question of offices in the Catholic Church” while the men discuss God and the world. Truly, it seems that European culture has reached its end here! And yet, despite it all, there are still people kneeling and candles constantly lit before the images at the entrance to St. Stephen’s cathedral. The Christmas and Advent markets found everywhere are (still) called just that – not “holiday” or “seasonal” markets. One finds here and there signs of devotion to Blessed Karl of Austria. 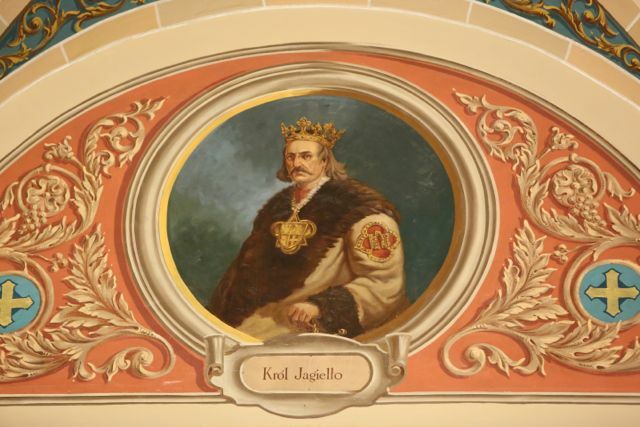 And in some less touristy, more out of the way cafes we find pictures of Emperor Franz Josef and Dr. Karl Lueger…. (Above)Solemn pontifical Mass with Cardinal Burke. 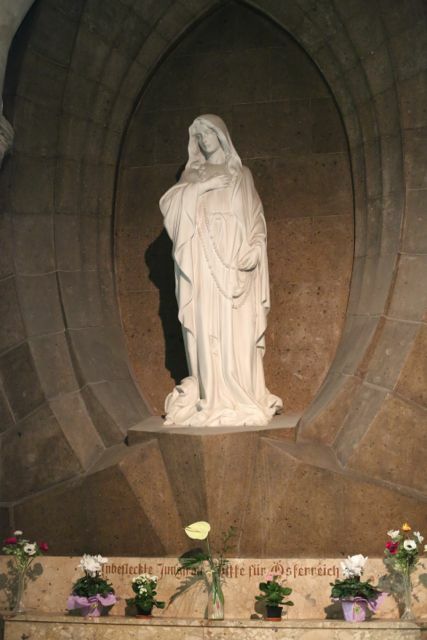 (Above) “Immaculate Virgin, intercede for Austria!” This shrine from 1936 in an ancient church is qualified as a relic of a prior time by a modern explanatory plaque. It has been four years since the death of Joseph Sobran. Scott P. Richert has written a moving tribute at the Chronicles magazine website. Sobran had to bear an extraordinarily amount of suffering in his last years. But his writings witness a true Christian acceptance of the various personal and health trials the Lord had sent him. I hope a younger generation rediscovers the man and his work. Scott Richert’s article is a good place too start.